A Money Maze Puzzle Bank provides a fun and even challenging way to give a gift of money, a gift card, candy, or any small gift! Put a prize in the Money Maze for your friends, family, or coworkers... but the trick is to see if they can figure out the maze to get to it. They'll have to earn that gift of cash, gift cards or tickets by solving a puzzle. 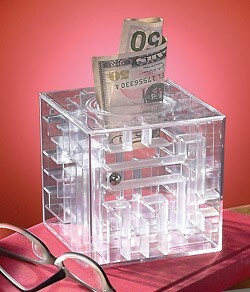 This intriguing clear plastic Money Maze Puzzle has inner compartment that can only be accessed by guiding the metal ball through the maze, which unlocks a trap door. Measures 3 1/2" square. Availability: This Money Maze Puzzle Bank takes approximately 1 business day to leave the warehouse plus transit time.